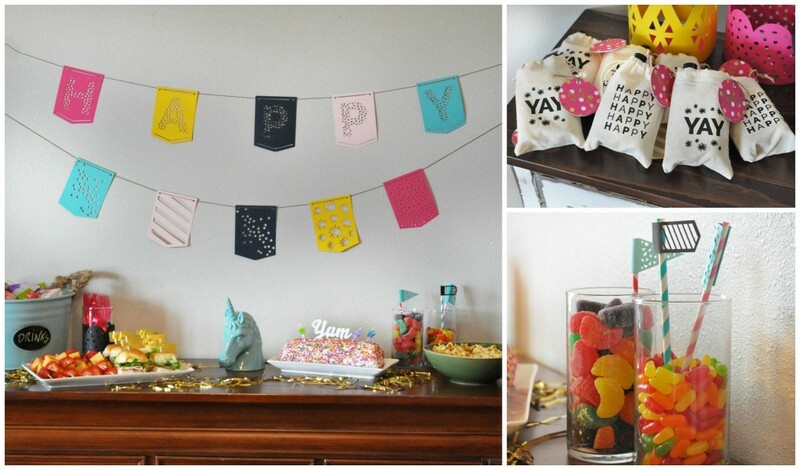 These party ideas will inspire you to throw a memorable birthday! We have ideas for party invitations, decorations, desserts, activities and more! We did it again. We had another 4th of July treat day in the office to put our co-workers’ cooking, baking and creativity skills to the test! (Click to see ideas from 2014 and 2013 treat days.) 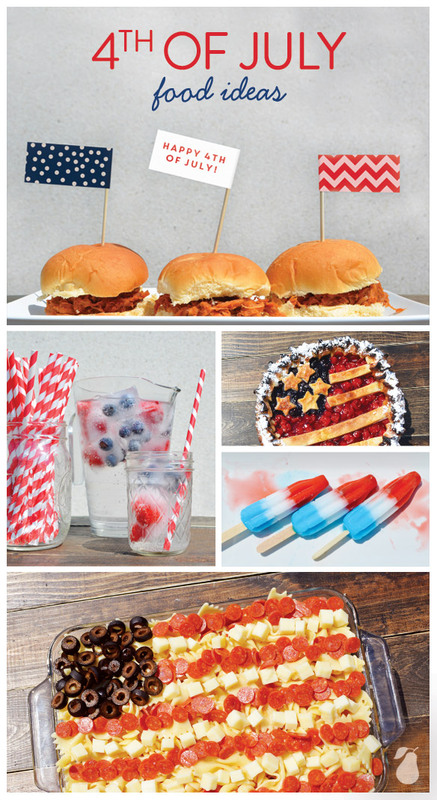 And, we must say, we are pretty excited to share these new 4th of July food ideas with you. 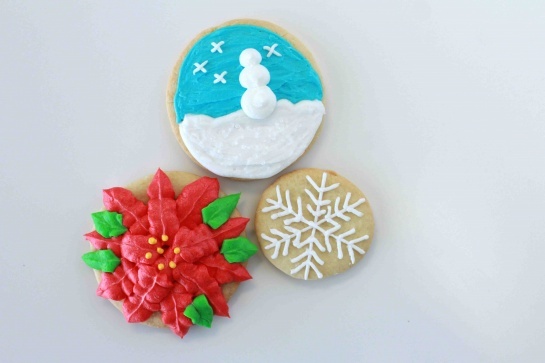 They are simple to make, and you can bring them to your upcoming gathering to impress your friends and family. We started the party with drinks to cool everyone down, using an idea we saw in the Hy-Vee magazine. We put raspberries and blueberries into ice cube trays and froze them overnight. We had sparkling water for our refreshment, but you could easily use lemonade or a favorite flavor of juice. 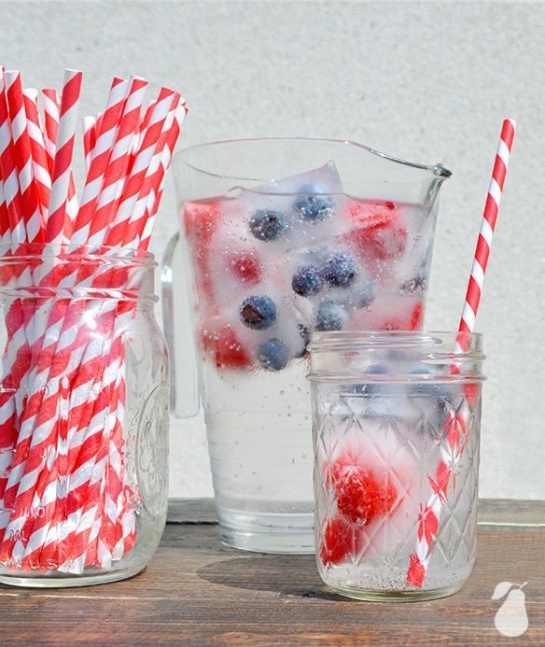 We poured the drinks in mason jars and added our Red Striped Paper Straws for the patriotic touch. For a main course meal we served a classic favorite, pulled pork sandwiches. For added fun, we personalized our Dots & Chevrons Cupcake Flags with red, white and blue and added a Happy 4th of July message. Then, we made two pasta sides. One in the shape of the American flag and one using the patriotic colors of red, white and blue. 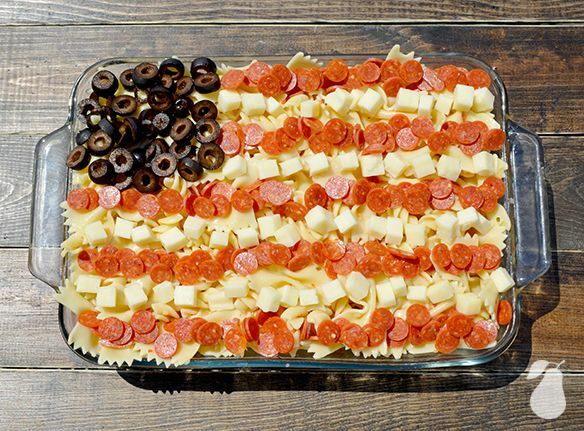 The first pasta salad had one layer of bow tie noodles, and then used mini pepperonis for the red in the flag and cut up mozzarella cheese in cubes for the white in the flag. Black olives became the star portion and the whole salad was dressed with Italian dressing. It was delish! 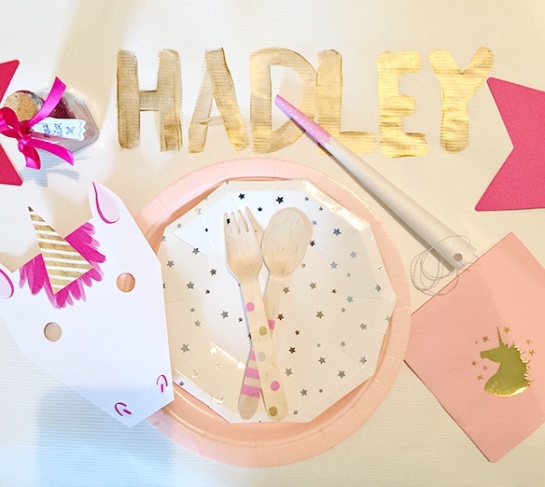 We couldn’t believe it when we saw our Magic Unicorn Mask Birthday Invitations tagged on Instagram as part of this amazing unicorn party. 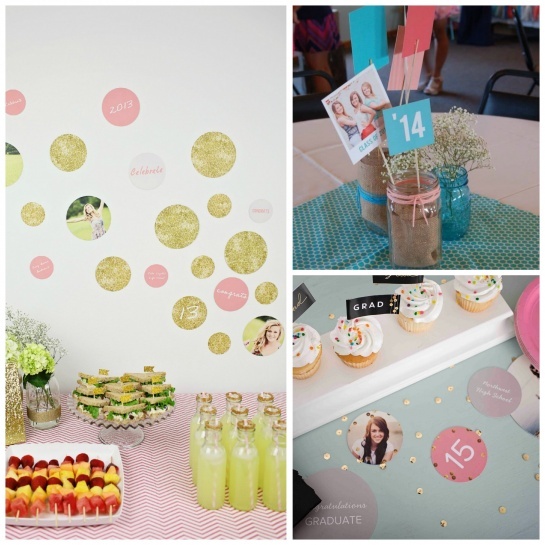 We contacted the creative mom, Adrea, to see more of her fabulous girls’ birthday party ideas and ask how the party turned out. She told us all about it. 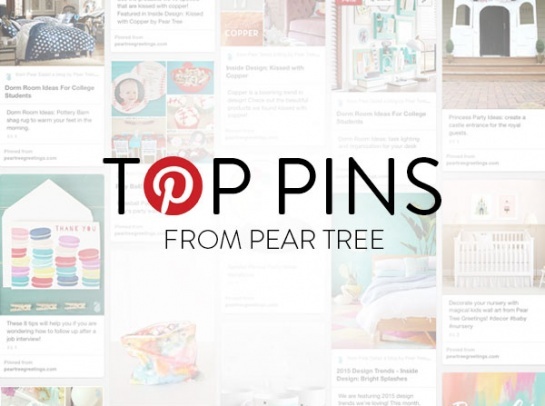 “We first found your gorgeous invitations at Pear Tree Greetings and became very excited about our theme! 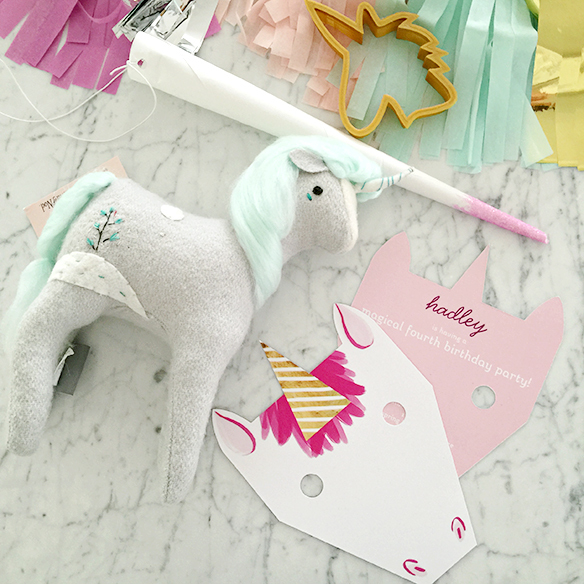 My mother ordered Hadley, the adorable unicorn set from The Land of Nod, that quickly became our color inspiration for her birthday party. 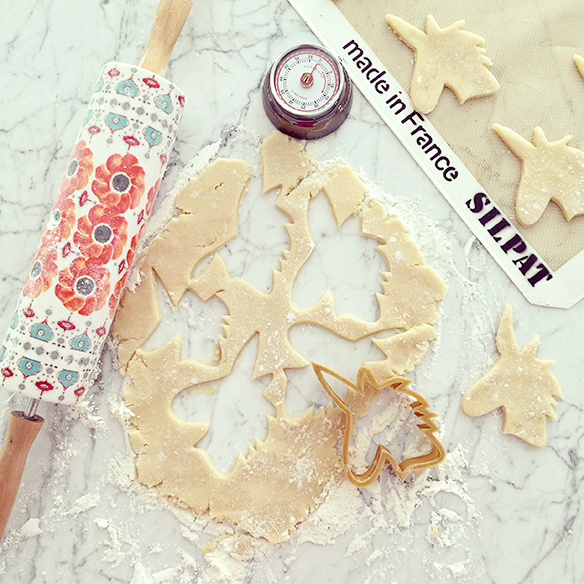 We made unicorn-shaped sugar cookies and I hand-cut tissue paper tassels to create a tassel balloon and tassel honeycomb tissue balls (honeycomb balls from Shop Sweet Lulu). “Tables that were originally planned for outside dining were moved inside our garage due to a downpour. My sister purchased craft paper to use as tablecloths and wrote each child’s name in gold paint. 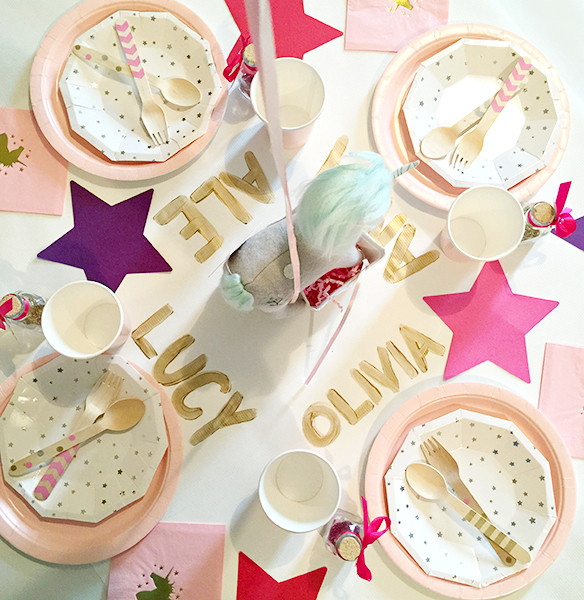 We then set the table with Shop Sweet Lulu silver star plates and unicorn napkins. Each child received a special glass of Magical Unicorn Dust (glitter), which was a big hit! Unicorn horns were made with cotton candy holders and dipped in glitter. Graduating from college is an exciting milestone. This is one time you get to celebrate your own achievements and show the world what you were able to accomplish with lots of effort, focus and drive. If you choose to celebrate this milestone with a graduation party, it should be fun and reflect all the hard work you put in. Here are our top 5 college graduation party ideas that will inspire you to personalize your party with your own unique touch. 1. 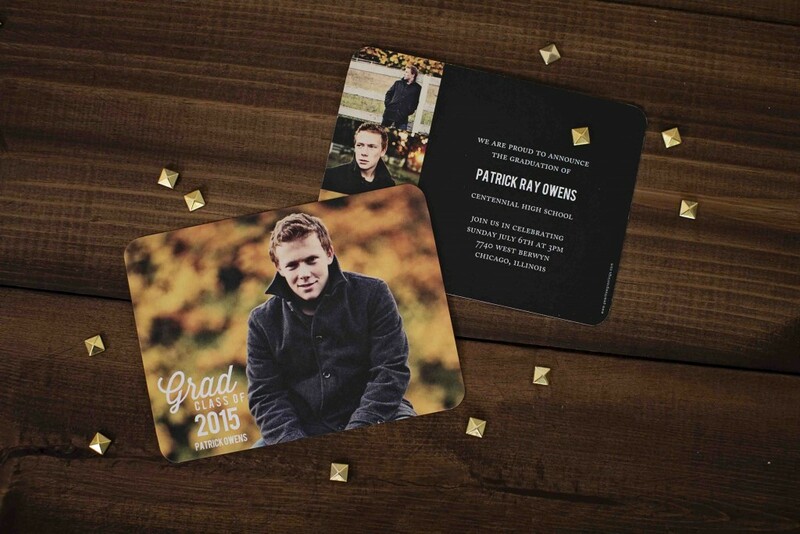 Start with a college graduation announcement that lets you add your own personality and flare to it. 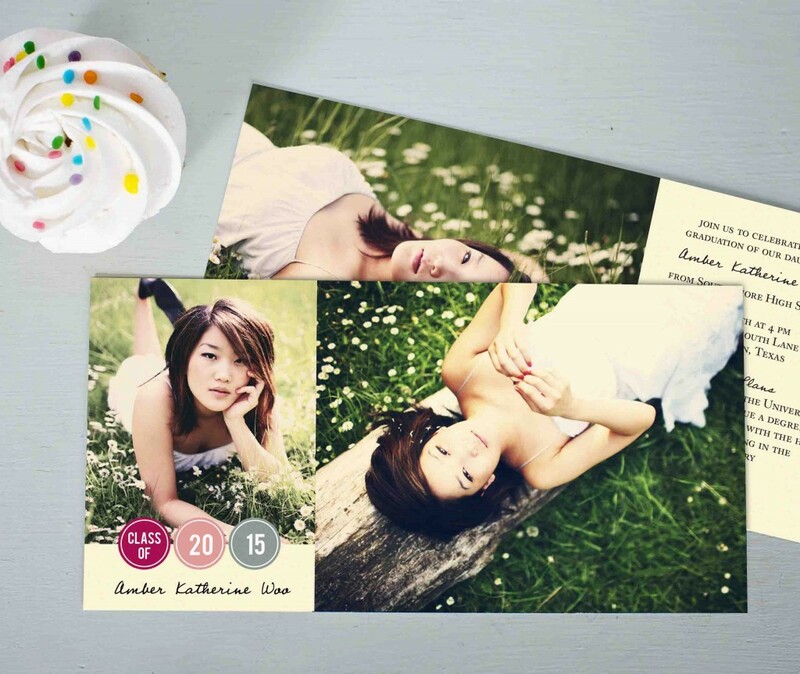 You can personalize a majority of our announcements with photos, text and your choice of over 70 colors! 2. 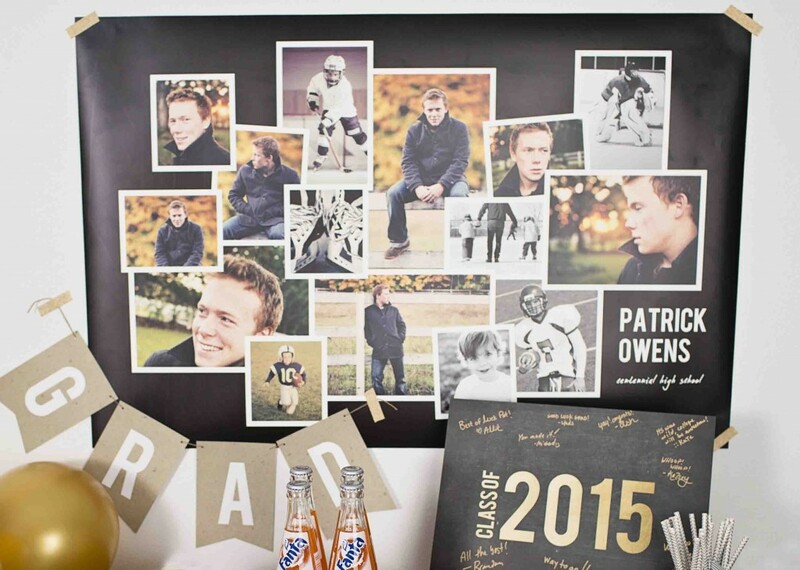 Show off your favorite memories with a custom graduation poster. It’s been hard work, but it’s also been fun trying new things and making new friends. Share your favorite moments with family & friends and soon everyone will be reminiscing about their college years. 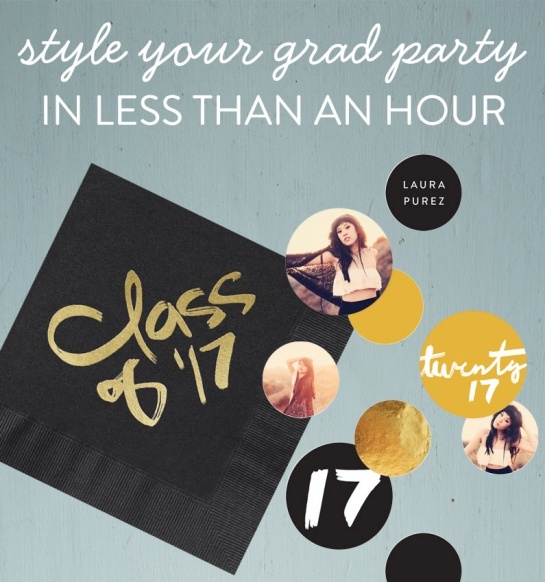 Planning a grad party can be an overwhelming task, but our graduation party ideas will help you get inspired in no time! 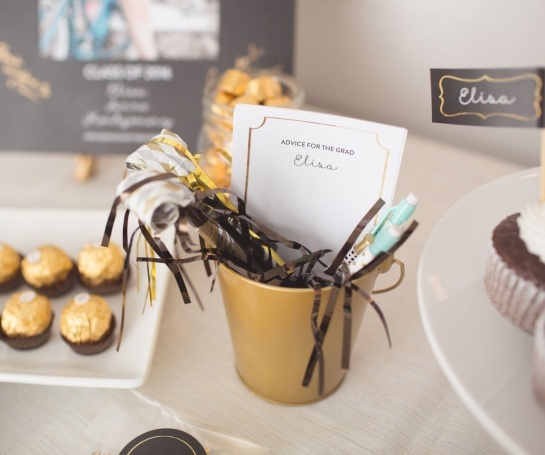 This classic-themed graduation party features plenty of unique ways to make your graduation party fun & memorable. To get this party started we chose our most popular graduation announcements ever, Favorite Photo. This simple announcement showcases a classic mixed-font greeting over a full photo. It also has room for four photos and all your party details on the back. You can even edit the black background color to your liking. 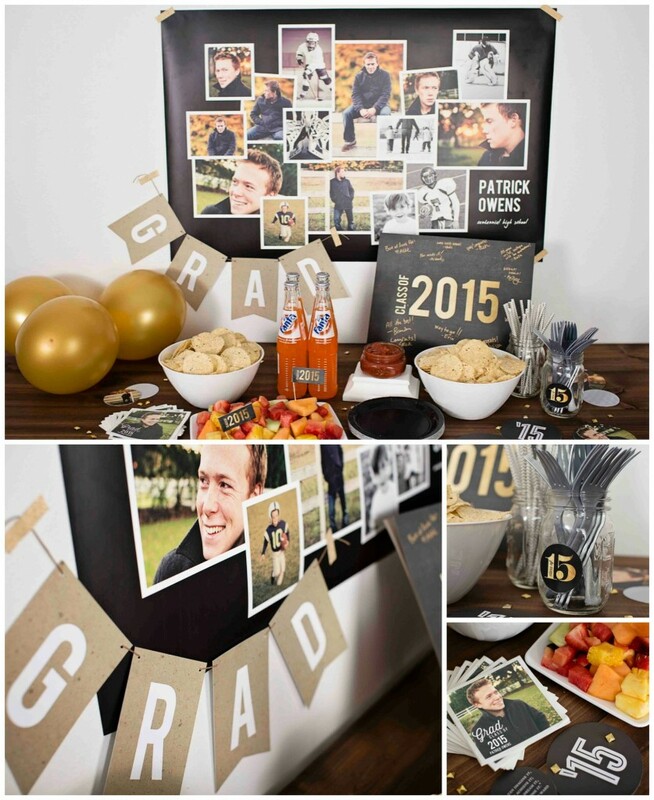 We wanted to create a space where guest could enjoy snacks while looking at photos of the graduate throughout the years. 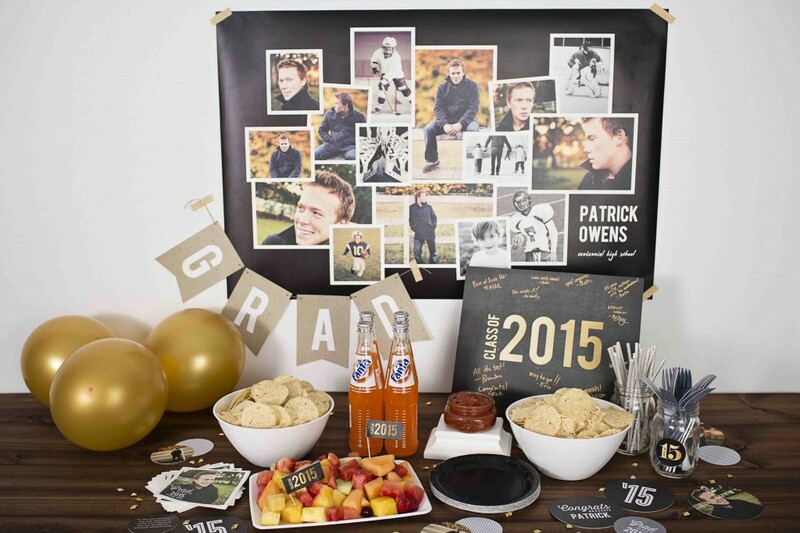 We used black as the main color and accented with gold and added a few pops of orange from the grad’s fall photos. The highlight of the table setup is the Snapshots Custom Poster, which we used as a backdrop. 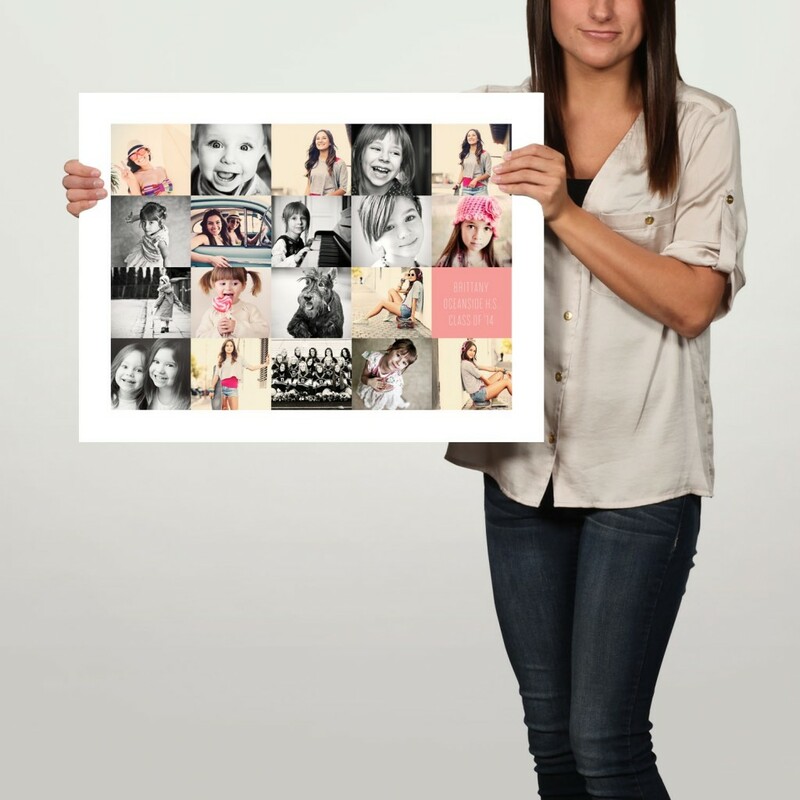 This poster features 15 photos, which allows plenty of space to feature baby photos right up through senior year. It’s an easy alternative the typical collage photo boards. As a bonus, it is tear-resistant and can be used indoors or outdoors. 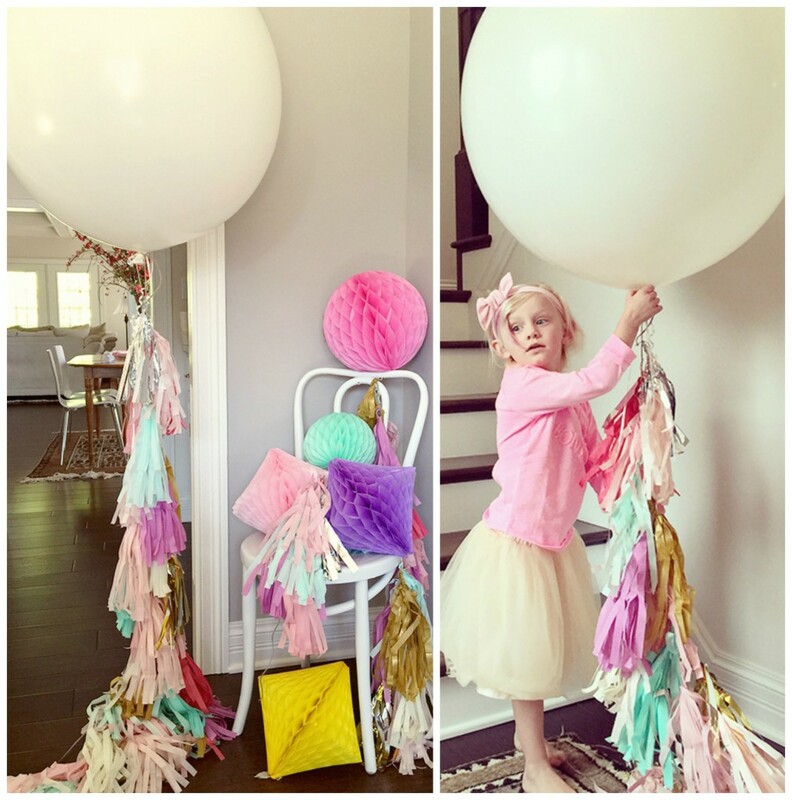 Birthday party ideas for girls seem to get more difficult to come up with each year. 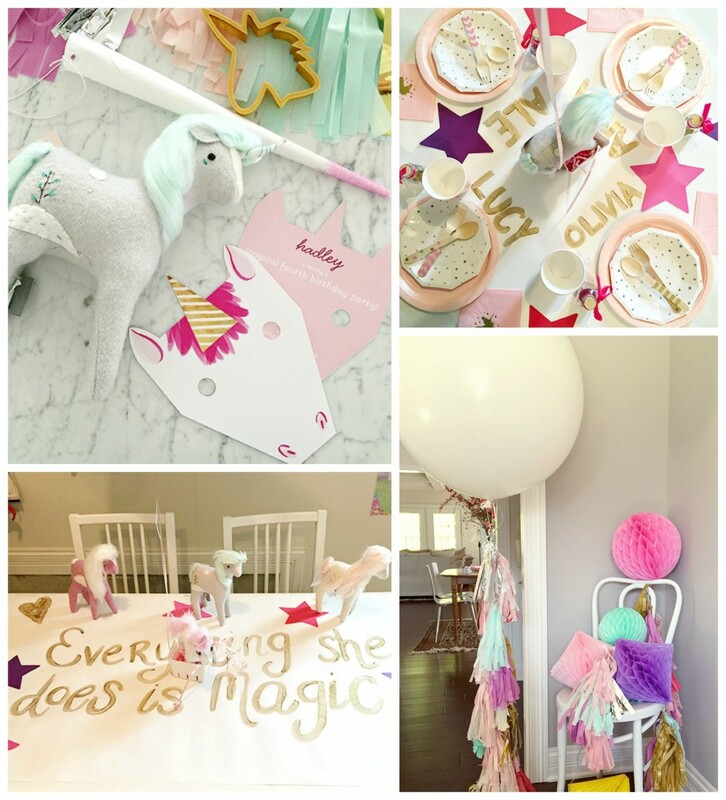 My daughter and I talked through a few different ideas and finally landed on a unicorn themed party. 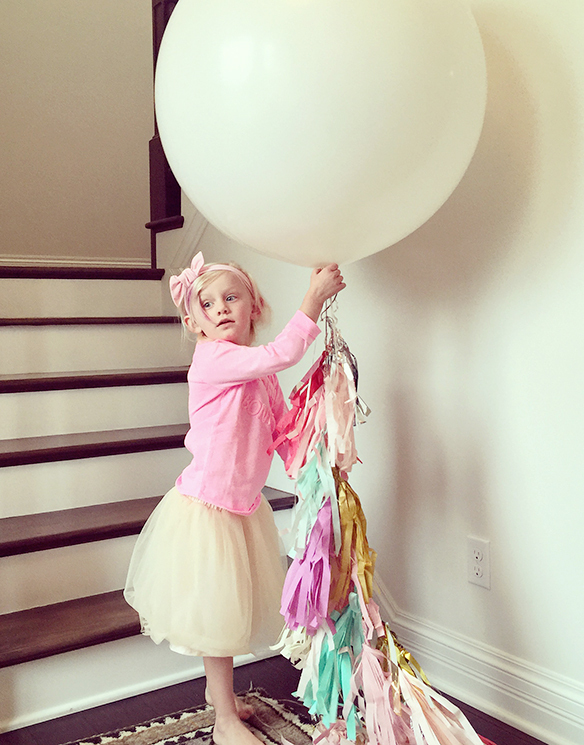 She loves anything pink and glittery, so we thought this would be the perfect theme to incorporate many shades of pink and several different accent colors. 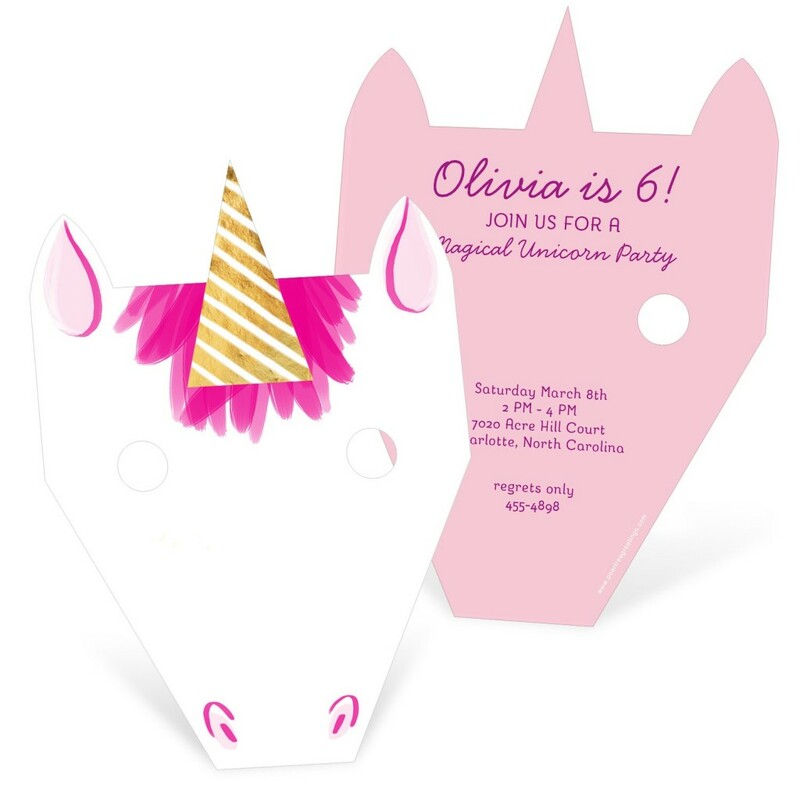 For the invitations, I decided to use Pear Tree Greetings’ Magic Unicorn Mask Kids Birthday Invitations because they were super unique and fun for the kids to open. I decided to keep the colors of pink and purple to go with the color theme of the party. 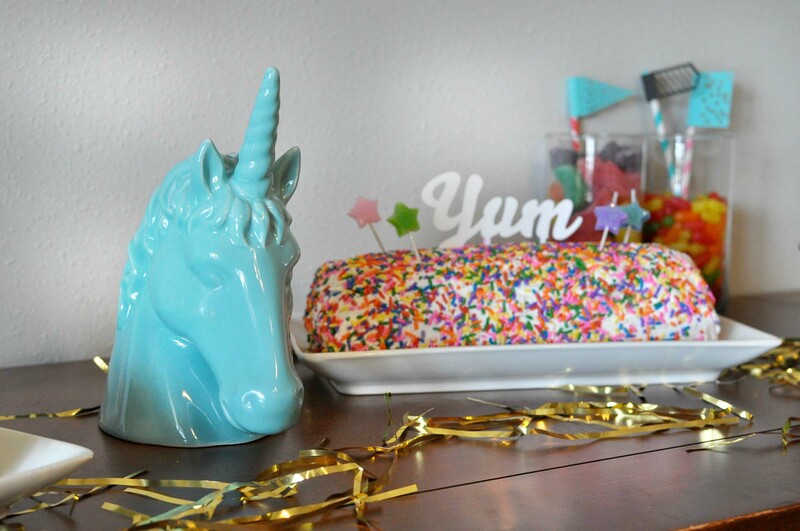 The centerpiece for the party was a unique turquoise unicorn that I had found a while ago and always knew that I would eventually be able to use for a party. The big game is just days away and whether you watch for the match-up of the New England Patriots vs. Seattle Seahawks or for the highly entertaining commercials or half-time show, one thing always holds true, there will be food and there will be lots of it!! 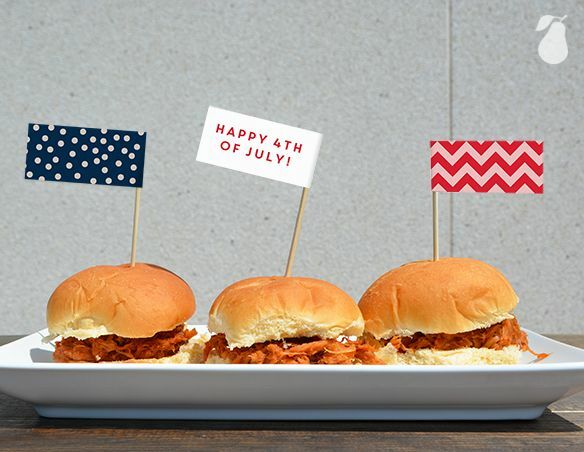 If you’re struggling to find ideas on what to bring to your party, we have you covered. 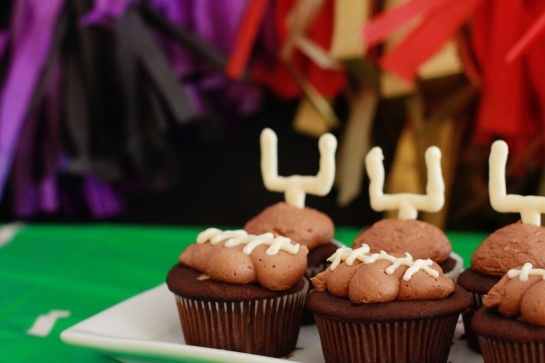 We are sharing with you our top 10 crowd-pleasing Super Bowl food ideas that will make you a hit at your party. 1. Pizza roll-ups. 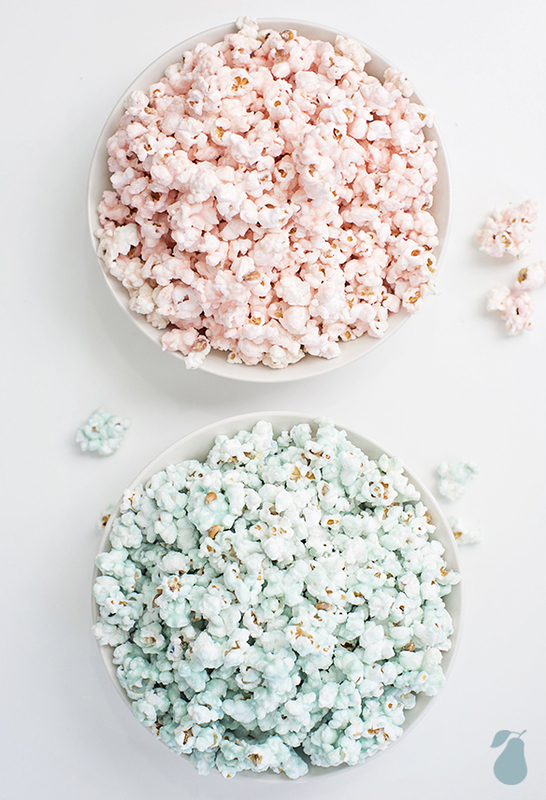 These are perfect finger foods for adults and children to enjoy! Get the recipe here. 2. 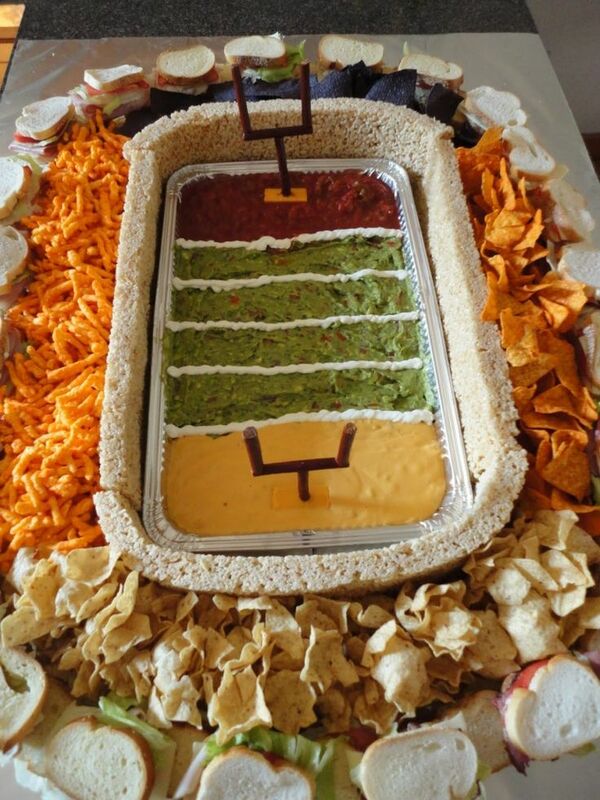 Football field chip dip. Create a stadium of deliciousness! It’s even outlined in sandwiches. YUM! Get the full idea here. 3. Pretzel bites. Always a crowd-pleaser: cheese & baked bread. Get the recipe here. 4. Jalepeno poppers. 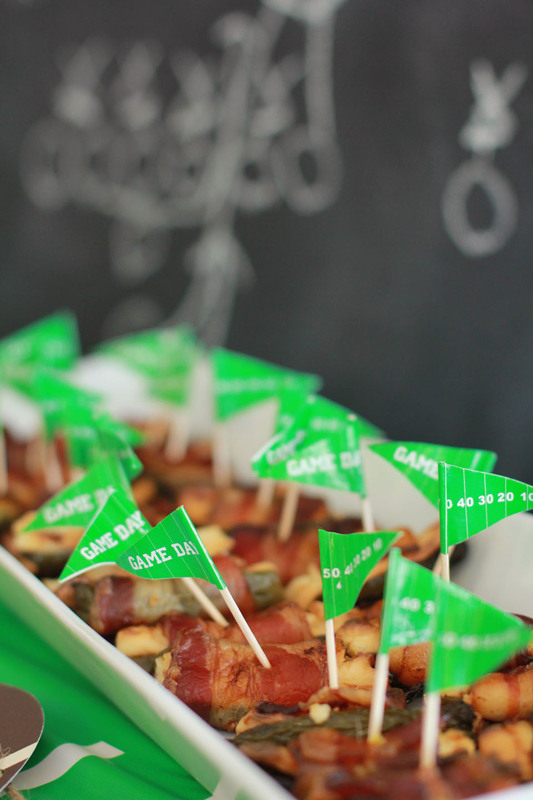 Jalepenos, cream cheese and cheddar cheese wrapped in bacon – delish! Get the recipe here.